Most kitchens have a spice rack or spice organization area somewhere. Whether you have a premade spice rack you purchased or a unique storage solution for your spices, you have them stored somewhere in your kitchen. This is important because if you like to cook, you most likely have a decent amount of spice containers. No one wants their spices making a mess in a drawer or taking up counter space by the sink. It is best to keep these spices hidden in a storage space or organized on a rack. This blog will show you a few different solutions to help get your spices organized and hidden at the same time. 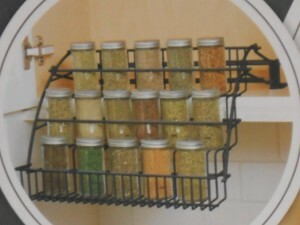 One way you can organize your spices is by using the Rubbermaid Pull Down Spice Rack. This is great because you can have them easily store up in a cabinet but pull them down when you need to use any of them. This gives you the best of both worlds. A hidden spice rack in your top cabinet and ease of reach with the pull down feature. This one in particular can hold up to 15 different spices and takes up very little space in your cabinet. If you like arrangin g your kitchen items as you please to let your creativity shine, this next idea is perfect for you. The HEX 24 jar kit comes with 24 jars with magnetic lids. Unlike other magnetic kits that make you use a piece of metal, these stick directly to your fridge. You no longer have to find room somewhere in your cabinets to stick your spice rack. You can now simply let them hang onto your fridge door and have them easily accessible for everyone who uses the kitchen. The other great thing about this idea is you can arrange the jars in any pattern you wish. If you like to keep them clumped together, you can do that or you can spread them out according to the type of spice in the container. Some kitchens come with limited cabinet space but tons of dr awer space. If this is the case with your kitchen, a Rev-a-Shelf drawer spice organizer will be perfect. 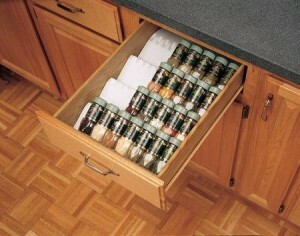 You can keep your spices stored at an easily accessible level in one of your cabinet drawers. Sometimes having the spice rack in a top cabinet makes it hard for anyone who is vertically challenged to reach. This drawer organizer is universal and can be altered to fit just about any size cabinets. The angle the spices are stored also makes it very easy to read which jar has which spice in it. You no longer have to pick up each individual spice container before finding the nutmeg you need. There are many people who collect spices throughout the year who can stock up any of these organization ideas. There are also people who do not collect spices and need to purchase a spice rack with the spices already organized within. A great starter spice rack would be the Cole and Mason spice rack. This is on a carousel so you can easily turn the rack to view all of the spices. 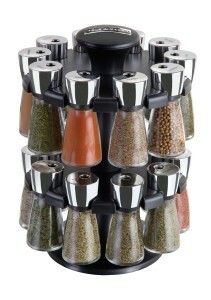 There are 20 different glass spice jars included with this spice rack to get you started in any cooking environment. They are very durable and will last a long time so you don’t have to worry about the jars or the carousel falling apart anytime soon. Any of these spice organization ideas will help you keep your kitchen tidy and neat while keeping it fully stocked with the essential herbs and spices. You can either buy the racks by themselves and stock them with your own spices or buy the racks with the spices in them already. Both methods will give you a new look to your herb and spice collections.